I started this blog in November, 2011 so I would not have to brown nose to some commercial company. I do have to pay for it, so don’t just sit there, make a comment! Bet you thought I was going to say contribution. I would appreciate your comment much more, so I know that someone out there is reading this blog. Unfortunately it was not until my blog got removed that I found out that others suddenly wanted to know what happened. I didn’t know that these others were out there lurking! So, Lurkers, please, please comment! good morning (Stephen(? )), thank you for your “Single Cell Flasher” circuit. I built the inverted version and it functionned at the first go! The flashes are a bit weak, may be because I had only a BC547B and not a C. Does it help when I exchange a resistor or a capacitor? Thanks from Switzerland. The reason it is not very bright is the circuit is designed to use very little power from the battery, and the battery will last for a long time. If you want a brighter flash, use the Blue Blinky circuit. just a lurker, appreciate your posts very much. I started with Dave Johnson’s 1vled3 74HC04 flasher, great for red LEDs, and runs forever on dead cells, but it wastes 2/3 of the chip. 2-Q Blue Flash from EPE Feb 2004 runs great with cheap parts, but only oscillates in a fairly narrow Vcc range (limits its use with supercaps). I haven’t had much luck yet with inductor-based low-V flashers like yours and Quantsuff’s, but still trying. Thanks again! Best of success with your project. I sincerely appreciate your comment. I have received over 40 comment spams in the last few days, it’s a welcome feeling to know there’s a real person out there. My supercharged JT flasher has a somewhat narrow range of battery voltages, so I would not recommend it. The Blue Blinky flasher will still blink down to less than 0.8V and will run for much more than a year off a single cell, so it’s a good choice. I am so glad that you are back. I was searching for your blog from a long time. Just wondering what happened, tried also the link from the Quantstuff’s website, but that didn’t work. Fortunately, he figured where your blog is located and updated the link to this blog. Well, thank you. I really appreciate the comment. I’ll email you. Just a lurker here. Have not built a joule thief, yet, but I expect to get around to it in the next 20 years or so. Thanks for taking the time to write up your experiments. Hi, you make a really terrific work on Joule Thieves! Thank you! You schemas turn me on LEDs with single AA cells, and its great. I builded schemas on germanic transistors and 0.3V was enough for starting LED(but dimly). But what if we compare SJT with ZXLD381 dc/dc on range 0.9..1,6V of input voltage? Do you plan that comparations. I have never compared my SJT with anything other than a conventional Joule Thief. The converter on a chip is probably better than my SJT. Thank you for the comment. I’m so glad you’re back up and running again! I, too, am a lurker. I have built LOTS of JT’s over the past four years, mostly from salvaged parts taken off old UPS circuit boards. I was turned on to your site a little over a year ago (don’t remember how, might have been a Google search) and found your articles fascinating, so when I recently wanted to try some of your variations on the JT I was very disheartened to find your blog had been taken down. Luckily, I had downloaded a few of the blog entries so I could view them on a computer at work that has no internet access, which is also where I do most of my experimenting these days, so now I can go ahead and play. Will you be reposting those articles? Thanks for all of the info in the past, and I’m looking forward to what more great stuff in the future. Great to have you back! I have a 1V, 3A solar panel that I want to use to charge 6V SLA battery. I checked some other circuits on the web and they use big torriod cores with 2N3055 transistors. Can I use a mostet like IRF44N to charge the battery? What circuit do you suggest I use? I can hook up the multimeters and check charging current etc. Very long time since we last communicated. You gave me very good help with my first joule thief circuits. I need your advise on the following challenge I have an 8 volt 0.3amp solar panel which I would like to use to charge a small lead acid battery 12 volt no more than 10 AH. Could you suggest a simple JT circuit that could be used to get this done. Thanks for your prompt reply to my request re: 8V 0.300 AMP solar panel, unfortunately i do not live in the USA and to buy this device would be more expensive than building a simple joule thief charger. e-mail from an address I can reply to. Thanks for giving my channel a plug. I have bookmarked this blog. I’ll be lurking. But I am not certain how to make the coil, what kind of wire, how much turns and the size. Would you please help me? I’ve tried to make the blue Blinky with a core extracted from a cfl but it did not work, the led lit but not flashed, it was always on. What can have happened…? At least the JT part is working. It seems that the flasher part is going fully on, and is causing the problem. R3a and b total about 1.35 megohms, and determine the flash rate along with the capacitor. Try changing this value to 1.5 or 2 megohms and see if it helps. Just add a 470k in series. Also, reduce R5 from 3.3k down to 1k and see if it helps. Also, if you use a fresh battery, it might stay on. Try a battery that has about 1.2V or so and see if it works. I tried to use another battery, a older one and increased the resistor to near 2 megohms. It worked perfectly. Thanks. Hi Watson, I’ve been following you and others about joule thief’s and have been wondering how much inductance would be too much? I have a lot of salvaged torid cores that have 200uh or more with 10 turns of wire, so 20 turns would be 800uh. Any insight would be appreciated. Keep up the good work. Good question. I’ll try to explain this in my blog dated Aug 9, 2012, here. Thanks for the explination. So as I understand it should be oh to have inductance as high as 1-2mh with out lowering the frequincy too much, I have some cores that have 1.2mh with under 15 turns of 26awg wire. The inductance is okay, what you want is low resistance in the wire. And 26 AWG wire is thick enough to have low resistance with only 15 turns, so the Joule Thief should work fine. Isn’t it strange that the led is connected to C and B of the transistor? Thanks. I’m happy to hear that what I’ve blogged is useful to others. I seldom get any feedback; yours and a few others keep me from getting discouraged and help keep me blogging. I would like to know what tools are difficult for the neophyte to get hold of. I might be able to help. Is there a way to build a joule thief that is powered by electromagnetic waves from celular, tv, radio stations or energy lines? If yes how can it be done? How do we can harvest energy from electromagnetic waves to lit a led? You can harvest radio frequency electricity from an antenna by putting a germanium diode on the end of the antenna along with a capacitor to store the electricity. The antenna should be a long wire, up to 300 meters long; the longer the better. I don’t know if there are radio stations strong enough where you live, but where I live, in a large city, there are many radio stations which put out enough power to give a weak electric current when the above diode and capacitor are on the antenna. This may or may not be enough to power a Joule Thief. If you live very close to the radio station, you will get more power from the antenna. Your SuperCharged Joule Thief looks interesting but the image is hard to read and zooming in just gets worse. Do you have a better image or PDF to read or a current link to get it from? I had someone ask about that recently. He had to click on it multiple times before it zoomed up to its original size. Here’s the full size picture of it. Thanks, Paul. I connected up some JTs to several AA cells. Most ran down to the point where the LED extinguished. One ran down to that point, then a few minutes later it blinked on, then ran down, then blinked on… Took awhile to finally kill that corpse but it eventually died for good. Must be the same phenomenon. thanks for sharing your ideas. Can you advice led flasher powered from 3v coin cell ? I’m looking for device that is small and long lasting power for key ring. Thx for reply. I can’t find MN13811 so i’l try with 3v flasher based on 2 transistors 2907 and 2222. Next i’l try second advice. I see that you are continuing you great work, keep it up. I have a request for you, i would like to light up three white led lights using an old cellphone charger(5V 0.500amps). The white 5mm LEDs will have a forward voltage of 3.3V at 20 milliamps. Subtracting that from 5V leaves 1.7V, which has to have a current limiting resistor to keep the current at 20 mA. So 1.7V divided by 0.02 equals 85 ohms. The closest value is 100 ohms, so use that and the current will be close to, but below 20 mA. Each LED will have its own 100 ohm resistor and the pair will be connected across the 5v. You can have as many as it takes to make 500 mA, about 25; but I would keep the current below 2/3 of the 500 mA, or 300 to 350 mA, which would be up to 17 LED/resistor pairs. If a LED went bad shorted, you would have the full 5V across the 100 ohm resistor. P = E squared over R, so 25/100 is 1/4 watt. You can safely use a 1/4 watt, 100 ohm resistor with each white LED. Hi Watson, I’ve been experimenting with joule thieves a lot lately. In particular, I tried your conventional vs supercharged setup. It didn’t work too well, though. The SJT seemed to produce less light than the standard one – in fact, any time I used it with the 680pF the performance was iffy to say the least. Sometimes it produced light, sometimes it didn’t, I couldn’t understand why. What is the point of the 680pf? And is there anything special about the 47uF one? Then again, it may have been partially bad design on my part – the resistance in my primary coil was almost 2 ohms. Can I ask why the coil is wound 3-to-1 (I assume that’s what “three windings connected together for primary, one winding for the feedback” means)? I’ve never seen this in any other JT schematic. I’ve seen a few designs elsewhere that use a (~100nf) capacitor between the 1kohm resistor and the negative path. The reason is that the energy in the feedback winding will go into the capacitor instead of being wasted by the 1kohm. Will this work? Some other people have used RLC circuits to apparently considerably increase the brightness of the LEDs. Is there veracity to this either? I believe you misunderstood how the coil is wound. I take 3 or 4 lengths of 30 AWG wire, typically 18 inches or 45 cm, and twist all four together for about a half inch, to hold them and make it easier to thread them through the core. I leave about an inch or 25mm of wire at the start end, then I wind all four at the same time onto the toroid core. Then when I’m done I cut off the twists. Then on one end I twist three of the four together and tin them with the soldering iron. Separate from the other three, I tin the fourth wire. Then I go to the other end, and with an ohmmeter, I find the separated wire and tin it separately. I twist the remaining three together and solder them. So I have two windings, one a single wire, and one with three strands in the same winding. This makes it easy to wind, since there’s 4 of the same kind of wire and they’re all flexible and easy to bend. And there are other benefits to the coil, which I won’t get into. The resistance of the coil should be much less than 1 ohm, about 0.4 to 0.5 ohm for 30 AWG wire. If you get the coil right, I think it should give the same results that I got. If you still have low light output, you may have another problem. If I had the problem I would first put the LED on a power supply and see if it worked normally. If so, then I would swap the wires of one of the windings. I have in the past got the wires backwards on one coil, and theoretically it shouldn’t work, but it did, putting out dim light. When I reversed one winding, suddenly the light got much brighter. Also make sure you haven’t got it miswired. Make sure that it’s wired as in the schematic. Also, if you’re using one of the proto boards, you may have corroded contacts in the board, which you can’t see. Pull the parts out and use a different section of the board to build it. Better yet, solder the parts together. Also you should use a decent transistor such as the 2N4401, PN2222A, or better, the BC337-25. If the transistor has too much gain, it may work erratically or not at all. I’ve found that putting a half dead cell with only one volt, or a Ni-MH rechargeable cell on it helps and it will work fine. If this happens, the resistor should be increased to a higher value, 3.3k or possibly more depending on the transistor. Persevere, don’t give up, and let us know how it’s working. That’s part of experimenting: overcoming challenges. That’s great! I’ll give that a go. I’m pretty sure I had coiled it rather poorly now that you mention it. One thing: what is the function of the 680pf capacitor? The 680 pF interacts with the coil to form a very broadly peaked circuit that causes the frequency to go up typically three or more times, and it increases the efficiency when it does. 560, 680, 820, 1000 pF all work, and depending on the coil, one may be a bit better than the others. The 1.5k resistor is typical for the commonest transistors such as the 2N4401, PN2222A, or BC337-25. but it may be changed to make the LED brighter or dimmer. I see. Is that because the feedback winding discharges into the capacitor instead of the resistor? I’m afraid I don’t understand why increasing the frequency increases efficiency. Also, why is the feedback winding connected to the output end of the primary rather than the input? There is a resistor, capacitor, and the coil winding, along with the diode. If the diode was an open (which it is part of the time), then I could see that the R, C and L would interact in the normal way, which is an RLC circuit. But the diode makes the exciting voltage into a DC pulse, and sort of pumps the RLC circuit. I’ll be the first to admit that I don’t fully understand the interaction of the components, but to me it looks like this pumping action speeds up the pulsing, and causes it to switch faster. I wouldn’t say that increasing the frequency increases the efficiency, I would say that the increased frequency is a result, not the cause, of the changes to the efficiency. In any case, the result is that I can put a luxmeter in front of the LED and measure the light output, and the Supercharged JT is putting out about the same light for much less input current, something like 40 to 50 mA instead of the typical 80 mA. I rewound it with 8 turns of enamelled copper in parallel for the primary winding – resistance was about 0.2Ohm, which I think was good. Sadly, even with the supercharged bit, it’s still not putting out a tremendous amount of light. I tested it against a 3.6v battery, it’s less than half as bright. I am using a 680pF capacitor and silicon diode, haven’t tested yet with schottky. Are there any other things I could do to improve light output for this circuit? On a related note, I have a wind-up torch that I’m planning on integrating with a joule thief. I’ve wired it up with a schottky rectifier – it outputs 4.5V and 70ma. I’ve also got a 2.2V 10F capacitor that I’m hoping to use in parallel with a zener diode so it doesn’t blow. Would this be feasible to use with the JT for producing a better light? And would there be any way of making the torch’s dynamo more efficient at charging the capacitor (since 2V would have to be wasted across the schottky)? Sorry, meant zener instead of schottky there. I have not seen anything at all in your comments that tells anything about the transistor. If it is using a BC337, 2N4401, PN2222A or equal then you should get full brightness. If you are using a 2N3904, BC547 or similar small signal transistors, you will not get full brightness. The transistor is very important for getting the best performance. I have not done any experimentation with wind-up, but I have done some experimenting with hand cranked LED lights. They don’t work very good at all, and I think the reason is poor design. They sell because people are warned to get a hand cranked light for use in an emergency. I think that they were so poor performance and so many people returned them and got their money back that stores are unwilling to sell them, and I haven’t seen them for sale for a long time. Okay, messed around with it a bit. I’ve got really good performance out of it – tested it against a 3.6V battery, and it’s almost as good. Part of the reason I was getting comparatively terrible performance was because I was using a depleted 1.2V NiMH which iirc when actually put in the circuit dropped to <1V (since it had so little charge). When I changed it to a decent 1.5V alkaline, it really lit up. The SJT is really effective, although I'm going to test it with a couple of other designs (like that flagiusz one). In the mean time, I have a couple of questions about the components themselves, some things I don't quite understand. Why are the coils would so that the currents (and thus rotating magnetic fields) oppose each other? Wouldn't the magnetic fields cancel out? I don't see why the primary would boost the voltage in the feedback if surely the magnetic field produced by the primary would induce a current in the feedback in the opposite direction to the one already flowing in it. Secondly, why does the magnetic field collapse at all? I'm aware that the saturation means there's no more induced voltage in the feedback loop, but wouldn't the current already flowing through it (from the positive rail via the primary coil proper) keep it running? Also, when the induction ceases due to saturation, why does it not immediately resume just after the core starts to collapse (and therefore cease being saturated)? Glad to hear it was only the battery. The transistor has inverted output compared to the input. The feedback winding must be connected so that it does another inversion so that the feedback is positive, to keep the circuit oscillating. There’s only a single magnetic field. The magnetic field does not rotate, as far as I know; it expands or contracts, changing polarity. Once the energy transfers to the LED, the current drops, and this decrease then reverses the polarity in the feedback winding and shuts off the base current. I’m not an expert in electromagnetic theory, and that’s what this discussion is about. Instead of trying with great difficulty in explaining something I know too little about, and I don’t think I’m contributing anything worthwhile by saying more, I have to refer you to some document on electromagnetic theory. I do know that the circuit has a positive loop gain of greater than one, so it keeps oscillating. And since it is not a tuned circuit with a capacitor, it does not oscillate with a sine wave, but instead with pulses, determined by the inductance and other circuit parameters. Saturation of the core? If the core must saturate, then how do you explain how a JT with an air core coil operates, when there is no core to saturate? It works just fine. I don’t see how a typical half inch toroid core could saturate with a power input of less than 1/8 watt. If anything must saturate, it’s the transistor, or the resistance of the circuit including the transistor causes the current to stop increasing. Thanks for the questions, but I’m sorry, I can’t offer much help in the subject of electromagnetism. Ah, okay. That clears it up somewhat. FYI in a ferrite core the saturation IS the key mechanism in switching… Obviously I’m not sure how it’s done in air cores, although the effect must of course be the same. Funnily enough, I’m actually studying physics at university and the electromagnetism part is what got me into electronics! But thank you very much for your help, will have to look back over my notes! It’s impossible to saturate a core that is in a vacuum, and air is the same. Yet a JT works just like it does with a toroid or E core or air gapped core or whatever. You can prove that this is wrong, though. “Basic Theory Applied to Joule Thief Pt. 1 The Coil” .. good stuff! Just a query though… were there further parts to this discussion (i.e. pt 2?) I can’t seem to find it. Hey, but anyway, whether you got round to pt 2 or not the rest of your blog posts are very, very useful. Thanks for your time. The part 2 was something that I didn’t really get around to it, so to speak, but I have added further information on the same subject. Search my blog for some key words such as bifilar, coil, feedback, etc. just wanna say thank you for sharing your work with us. Here are some pics of flashers I made using the supercharged jt circuit you published. Thank you for the links to the great looking photos. 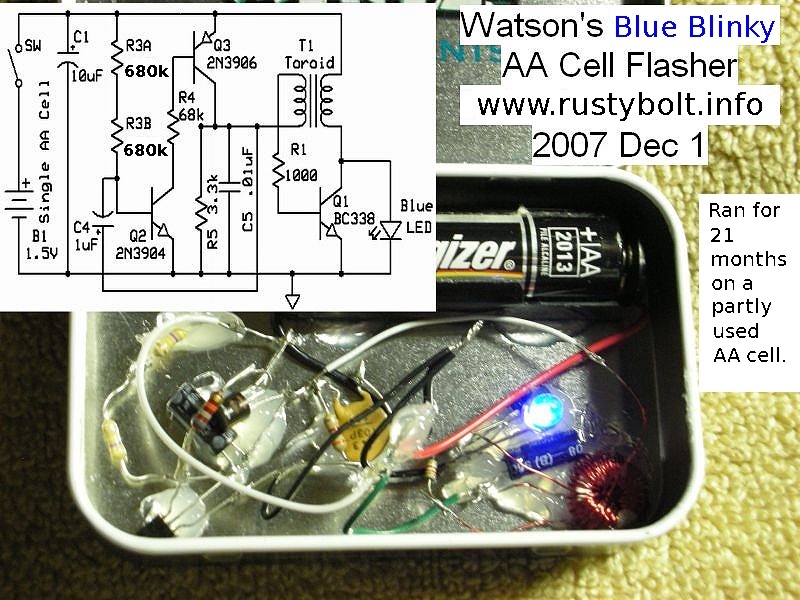 The Blue Blinky that I blogged is better and has a longer lasting battery than my Supercharged Joule Thief Flasher. My watsonseblog.blogspot.com was removed almost two years ago, and this blog is the replacement. If you see any picture or link with my old blog, please let me know so I can change it or leave a message with the new blog. Thanks. First off, I’ve followed your blog for a while, I’m a really big fan of the JT and its variants. I’ve found a good use for it: I’m sick of having to buy lots of batteries for my bicycle light that don’t last that long (some of them need 3 or 4 AAAs), so I removed all the components from one of my old ones and shoved an SJT with a couple of bright white LEDs, run off a 1.5V battery instead. Should be a lot more efficient. I have a question though. How can I reliably measure and/or control the output voltage of the JT? I’m currently trying to build a small power supply to recharge a Li-ion battery and I’d prefer to be able to keep the output voltage at (or rather below) a known level rather than invest in a buck converter to regulate it. I don’t have an oscilloscope at the moment, trying to find one that’s affordable, but until then I won’t be able to measure it directly. I’ll write up a blog as a reply to your comment. Regarding lost info, I found several of the pgs of your prior site with pics on the web archive “wayback machine” (in case you want to copy/paste something from it). http://web.archive.org/web/20110902001838/http://watsonseblog.blogspot.com/ There are 10+ yrs of history. Thank you very much. I found a lot archived on Yahoo, and I may be able to find some that wasn’t there. Some of the schematics and pictures are still posted to another blog that I had on blogspot, called watsonspics, I (or anyone) can download the pics, but I can’t access any of them to update them because they deleted my account. What really surprised me was that when I got my cell phone, Google pulled all of the stuff associated with my email address together and I couldn’t figure out where this was hidden on the Internet. It’s like opening a closet and finding a bunch of stuff you never thought you had. Great blog! Just discovered on Zite. Have been playing with joule thieves, but you are way ahead of me. Thanks for the kudos. I’ll have to check out Zite – never heard of it. looking for a cheap 50ua analog meter to go into an ESR tester i am building, to test capacitors on a vintage 3kw Furuno Radar… any advice appreciated. Analog meters are expensive and hard to find nowadays. Instead you can use a resistor to turn the current into a voltage across the resistor and then use a digital multimeter to measure the voltage. The typical cheap DMM measures 2 V on the second lowest scale. A 20k resistor would drop 1 v at 50 microamps, so putting the DMM across the 20k should give you a reading of 0 to 1 V instead of 0 to 50 microamps. You could use a 10k resistor and get 0 to 500 millivolts. Good advice about using a DMM than an analog meter. I wanted to ask if you got the 10 watt led flasher finnished and how you made out with the DC-DC convertor ? If you mean the LT1073 converter chip, I haven’t used it to power a portable radio because it only puts out 7 to 20 milliamps, and a pocket radio needs 30 or more. The real test is if the radio can run on the AM band with the converter power. The AM band is sensitive to radio frequency interference caused by the converter. it will tell if there is is a need for more RFI filtering. I mounted the 10 watt LED on a heatsink. I was going to use it for the flasher but then I had this brainstorm about converting a slide projector. It’s so old that the power cord is crumbling and unsafe and it uses couple hundred watt lamp that’s hard to replace. So I thought that I would remove the lamp and put the 10 watt LED in its place. But the LED puts out a small fraction of the lamp light and the slide looks dim when projected on to the wall. So I gave up on that idea and I haven’t got back to the flasher yet. I hear you, hard to decide what’s real and what’s not on the internet these days especialy youtube. Some of these hoax’s are very clever. So far I was only fooled once, but didn’t take long to discover the truth. Don’t know why they do it maybe they get paid to keep the general population guessing. Better slow down this could evove into a conspiricy theory. Great Blog! Can you advise about a Joule thief circuit that would work with input voltages as low as 90mV? Any way to make it simple and cheap from readily available components? I’m impressed by your super joule thief variant; I punched up both vanilla JT and SJT in Tina-TI and Tina agrees yours is more efficient. But I truly do not understand what it’s doing. Could you sometime go through an excruciatingly detailed description of exactly how it works? I’m sure many of us would much appreciate that. Thanks! In 2009 I originally started out with the circuit that other JTers had come up with, and they claimed that it was brighter than a conventional JT. This circuit had a 1N5817 Schottky rectifier in series with the LED, and an electrolytic capacitor, about 10 uF, across the LED. So it just changed the pulsed DC to rectified and filtered DC. I was puzzled, because a half volt dropped across the 1N5817 when it was conducting should waste power and I thought the LED should be dimmer. So I rearranged the circuit so that the LED current was not going through the 1N5817. I connected the LED directly across the emitter and collector. This left me with the anode of the 1N5817 connected to the collector and then through the 1k resistor to the feedback winding, so I had the SJT circuit. But the LED wasn’t very bright. Oddly, as I experimented, I found that as I decreased the value of the capacitor, it got brighter until it hit a broad peak around 500 to 1000 pF. And then I went about comparing it to the standard JT, and found that it was brighter and more efficient. I really have never tried to approach it from the theoretical standpoint. I’ve done the legwork by building many of these, and they all work as a SJT, not as gimmicks or quirks caused by some odd behavior. At one time I used Linear Tech’s LTspice and at that time I didn’t think that it would be worth simulation because I thought modeling a transistor in the nonlinear regions wasn’t ready for prime time. Maybe now it has matured. I went through a lot of electronics tech and math training, but not engineering, I think because I was training when computers were still mainframes using Fortran to solve complex problems. I was more into consumer electronics but that was a dead end because it became cheaper to buy a new TV or stereo than to repair one. So I ended up in datacomm and telecom, where all the internet started out. I guess I was lucky. What someone should do is get some good ‘scopes and monitor the voltages, currents and waveforms, and see what’s different between a JT and SJT. Maybe break the feedback loop and put a signal generator in its place. I had an idea that it might be the 680 pF cap is broadly series resonant with the feedback winding. But I haven’t tried to find out. I guess that’s about all I have. There is a lot more out there on the ‘net. Hm, okay. Well I have some vague comprehension, but only that. What I observe in the simulation (Tina-TI isn’t perfect, but it’s pretty good and it’s free) is that where the JT’s voltage across the LED is a sharkfin style curve, the SJT produces something much closer to a square wave. It slopes off some before switching off, but is much closer to square. Current is still a shark fin curve. So while it doesn’t produce the ideal square type wave for both voltage and current, it’s a lot closer. What I infer from this is the added components somehow bias the transistor so when it slams on and off, the regenerative effect is much faster, thereby improving overall efficiency. I have yet to really understand exactly how it does that, but it does seem to be the what. I’ll continue to ponder this mystery. But I admire the low parts count elegance of it, even if I don’t really understand the how of it yet. Okay. Having gazed at some length upon the simulator’s plotted voltage and current data, I believe I understand what’s happening. Basically, when the inductor is dumping into the LED, the cap is absorbing a small amount of that current as it charges. When the inductor has discharged enough that the cycle reverses, the cap helps the feedback coil along a bit, dumping its charge into the transistor’s base, thereby speeding up the transistor’s turn-on, reducing the time the transistor spends in its linear range, so more current gets to the LED in the early part of the pulse, instead of being dissipated in the transistor. This theory would explain why a cap too small accomplishes little; a certain minimum will be needed to get the transistor fully into saturation. And too big a cap won’t help, because it would divert more current from the LED, and isn’t helpful in turning on the transistor once it’s already on and in saturation. The sweet spot for that cap will, I think, vary with the toroid used and the transistor, so I’d suggest anyone doing a lot of work with SJTs should get their hands on a variable air capacitor (the type that used to be used to tune tube radios) and a capacitance meter: twiddle the variable to find the optimal for the parts you’re using, then read its value and solder in appropriate caps for your circuit. At any rate, this is what I think is going on here. Any way you cut it, I remain impressed by this modification of the basic JT circuit; simple, cheap, elegant. Thanks for publishing it! Thanks for the kudos. Yes, that’s what I did. I used an old variable capacitor from a tube radio, and i had to connect both sections together to get enough picofarads. It gave me a very broad peak, so anything around 680 pF seemed to work ok. I bought a pack of 100 assorted capacitors from Radio Shaft and sorted them into piles by value. Most of them were marked 680 pF ceramic disks. I measured one, and found it was too low, only 560 pF. So I measured a bunch more, and they were all too low. Apparently they were factory rejects. But even though they were low, they all work okay for the SJT circuit. I designed a SJT circuit board using ExpressPCB free software, and sent it in and got the PC board back and I sawed it into a bunch of SJT boards. I’ve built all of those using different toroid cores and transistors, and they all work about the same. I even put the parts on the board to make it flash, but it’s not as good as my Blue Blinky. Oops, I misstated a little; I think the quicker turn-on will cause more current/energy going into the inductor, not the LED, but still reducing linear time on the transistor. Whether the cap helps turn the transistor off faster, I still don’t know. The curves suggest it does, though I’m not sure how it might be doing that. I think I understand the SJT now. When the power coil is in discharge (dumping through the LED), it charges the capacitor. The limit the capacitor could in theory charge to would be the LED Vf, but it will never get that far. As the cap charges, it lifts the bottom end of the feedback coil, thereby also lifting the top end of the feedback coil. (Recall that during this part of the cycle, the top end of the feedback coil is lower voltage than the bottom end.) When the cap charges sufficient that the top end of the feedback coil reaches NPN threshold (around 0.6V), that begins the NPN’s turnon. This is what’s different from the vanilla JT; the NPN turnon is begun by the top of the feedback coil hitting NPN threshold as always, but in the SJT that’s caused by the cap lifting both ends of the feedback coil. In the plain JT, that happens only once the coils have reversed. Since the upper end of the feedback coil *starts* the field collapse event at 0.6V or so, as soon as the inductors flip voltage, the NPN is very rapidly snapped into saturation. In the plain JT, that takes a while as the NPN base, driven by the feedback coil, rises up to the turnon threshold, then the NPN takes a little while to turn on. That takes some time, so the plain JT NPN spends a little while in linear mode. In the SJT, since the cycle starts at threshold, as soon as the coils flip polarity, the NPN base is immediately driven into saturation. There’s also a difference in that the big inductor of the SJT never stops some level of forward conduction; but the current ramps up and down through the cycle. I suspect that’s part of the reason the SJT runs at higher frequency than plain JT. At any rate, that’s what I think is going on with the SJT. I was thinking about how to make the SJT turn on and off with daylight, to conserve battery capacity. You posted a circuit using a CdS cell and a low power JT, but I’d like to do this to an SJT. Here’s my thought, to see what you think. MOSFETs are available in depletion mode, ie they conduct unless the gate is pulled to cause pinchoff. They also have very low on resistance, varying by device of course. P channel MOSFETS pinch off when the gate voltage is raised. The gate current required is measured in nano or picoamps, as it’s only a leakage effect; MOSFETS are voltage controlled devices, unlike bipolars, which are current controlled devices. So… Suppose we placed a MOSFET between the SJT’s emitter and ground. If we drove the gate with some sort of photovoltaic device (produces its own voltage when illuminated) such as an LED or two, then light falling on the PV device would raise the gate, pinching off the NPN’s emitter and preventing operation of the SJT. Do you see any flaws in that notion, do you think it’d work? If it did, we could retain the benefits of the SJT while gaining the run at night behavior, and do it by adding only a mosfet, LED, and possibly a bleed resistor. What do you think? On #1, I’ll have to take your word for it, since I’ve never tried to analyze any of the cyclic currents, other than the LED and battery. #2. The depletion mode MOSFETs are very rare, probably because low power ones are very similar to JFETs. But you can do the same thing with a BJT. So putting anything in the emitter controls all of the current, but if the MOSFET has any voltage drop, then it will dissipate power, and the emitter has the highest current, so the MOSFET will waste the most power. It’s better to put the MOSFET in the base circuit so it has the least current, voltage drop and waste of power.